/ Is the Cat Mate Pet Fountain Worth the Money? Is the Cat Mate Pet Fountain Worth the Money? Pet fountains have become very popular over the past few years. Whilst, they are more expensive than a static water bowl are they worth the extra money? Dyson and I, therefore, tried out the Cat Mate Pet Fountain which has been one of the top water fountain sellers for a few years. Why Are Water Fountains So Popular? Well, cats enjoy fresh, oxygenated water. After all, how many times have you found your cat drinking from a dripping tap? Furthermore, if a cat is enjoying it’s water then it will drink more which cuts down problems from kidney disease and urinary tract infections. Also, if you have a cat that eats a lot of dry kibble, they really do need a good supply of fresh water. With a static water bowl, water quickly becomes stale and not so appealing to your cat to drink. Therefore, a pet fountain encourages a cat to drink more. 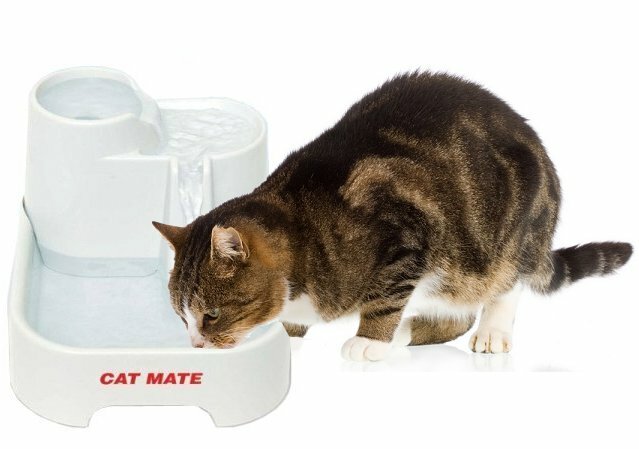 The Cat Mate Pet Fountain will offer your cat a fresh supply of endlessly moving water. Thus encouraging your cat to drink. 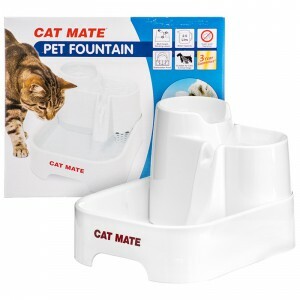 What is the Cat Mate Pet Fountain? The Cat Mate fountain holds around 2 liters (70fl oz) of water which is about average for cat fountains. It is made out of a sturdy plastic which is very easy to keep clean as it is dishwasher safe. Furthermore, there are only a few parts in the Cat Mate pet fountain so it is incredibly simple to put together. It is probably one of the easiest cat fountains to assemble on the market today. But what did catch my eye with this water fountain was that there were three areas available for my cat to drink from. Each drinkable area is also at a different height which is great for older cats that find it a little tricky to bend down. But, this is also great for smaller cats. Each of these three areas also acts slightly differently with water flow. So you have the top area which acts like a bubbling brook as the water bubbles gently into this area. The middle bowl is a gentle stream which takes water from the “brook” at the top and passes it to the lowest area via a waterfall. The base bowl, therefore, is like a large pond with a waterfall flowing into it. Your cat can also drink from the waterfall itself. 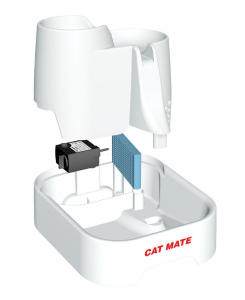 The Cat Mate Pet Fountain also comes with a flow dial so you can alter the flow speed to suit your cat. And to keep the water fresh and cool it has a removable poly-carbon filter which traps excess dirt and cat hair. This helps purify the water. The filter can be easily replaced every couple of months and it is also easily washed under running water. The Cat Mate water fountain is probably one of the simplest fountains to set up as it only has four parts. Just place the pump into its compartment in the bottom bowl, slide the filter into its guide points – easy to see which way around this goes as one edge of the filter is curved so fits into the curved guide. Then just slot the top bowls into the base – it fits very easily and without having to exactly line things up. Finally, fill with water and plug into the mains. Just do not plug this in without there being any water in the bowls. The power cord is a good six feet in length so you can position the Cat Mate anywhere on your floor within 6 foot of the power supply. This is an important issue for many people – how easy is this pet fountain to clean? Well, this should make everyone happy – this unit is very easy to clean and I get no mold build up in it as the design is so simple. Switch it off at the mains, empty out the water and then the two plastic parts can be just washed out or you can even put them in the dishwasher which makes clean up a cinch. To clean the filter run it under running water and the pump itself can also be cleaned under running water. If you live in a hard water area you might want to clean up any scale or other crud from the pump and I have used an old toothbrush for this in the past. So is the Cat Mate Pet Fountain quiet? Well yes it actually is. You can hear the water gently bubbling when you are up close but that is it. If it does start to gurgle then either the water level is too low (you do have guides at the side of the bowl with the min and max water height) or if it becomes clogged with cat hair. Will your cat use it? Well mine uses it regularly and seems to love it. Due to the three levels you could also use this if you have a small dog. My old cat also used to regularly use it though she drank from the lower bowl. What about replacement parts? Well as there are only 4 parts to this fountain and the only really moveable part is the pump then not too many things will go wrong. The filters should be replaced regularly and if the pump does fail then this is also easily changed. There is a 12 month guarantee on the pump. How often should you refill the water? Well I top it up every couple of days and then I do a full clean and full refresh of the water every couple of weeks plus rinse out the filter. I actually find that the filters last longer than the manufacturer says. The Cat Mate Pet Fountain is one of the best fountains I have bought. My cat gives it a major paws up. Replacement filters a little more expensive than the plain charcoal ones. So is it worth the money? Well yes, I would say it is. I have a cat that is prone to cystitis and the Cat Mate Pet Fountain encourages her to drink a lot more. I used to find a lot of muck on the top of the water when I used a static bowl, even if I emptied the water each day. Now all the muck is caught in the filter so the surface of the water looks clean and fresh. Overall if you are looking to get your feet wet and buy your first pet fountain then you can’t go wrong with the Cat Mate Pet Fountain. It is currently available here on Amazon. Great review of the Cat Mate Pet Fountain! I love the layout and the information you put at the top for the price, quality, ease of use, and ongoing cost. Very nice! I don’t think the price of the filter is bad at all. I don’t have cats, I have dogs. But I even like this for my dogs. Then they get fresh water all the time. Great review and thank you for sharing! Thank you very much for your comments. This pet fountain is good for smaller dogs – large dogs would probably need more capacity. I like the way you review cat mate pet fountain.I learned many thing because of how you explained it and the article is so informative. Also it is enjoyable to read. But i have some questions. Is it good for 3 cats? I have 3 cats and im wondering if 1 of this is good for them. also is it bang for the buck? based on its materials? Very cool, I never realized that a Cat fountain existed in any form. I will have to do further research. I guess my only question would be due to it being a source of constant running water. That if at all on any level does mould or algae ever pile up at all making it harder to clean? I see it has filtering, and this may reduce these two things immensely I would assume. Really cool concept, thank you for the info.